Terre Sainte divisee en royaumes d'Israel et de Juda de 975 a 588. 1 : 60800000 Johnson, A.J. 151. Palestine and Lebanon. The World Atlas. 1 : 1250000 USSR (Union of Soviet Socialist Republics). 1 : 1320000 Migeon, J.
Syria Phoenice, Syria Palaestina, Provinciae ab aerae Christianae anno 70 usque ad Diocletiani tempus; Phoenice, Coelesyria, Decapolis, Iudaea Herediadarum tempore. 1 : 2000000 Menke, Th. 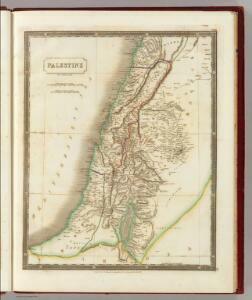 1 : 1200000 Petermann, A.
Palestine, Royaume des Israelites, Les Douze Tribus. La Terre Sainte sous Salomon. Turkey in Asia (Biblical Regions) The Holy Land And Its Borders. 1 : 696960 Fullarton, A. & Co.